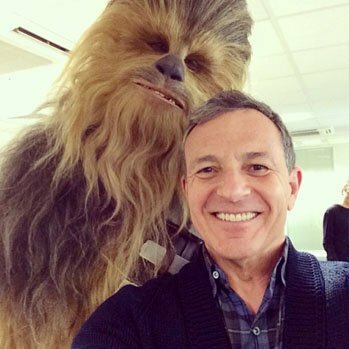 Star Wars: The Force Awaken’s Chewbacca has already been seen! I’ve spoken to two people have seen Chewie from The Force Awakens. One has seen photography of the Wookiee and another has seen him in person at Pinewood. Both said the lighting and filter probably play a little bit with his look above. In their opinion, he is a little darker with a few grey hairs here and there, but nothing drastic compared to his Return of the Jedi costume. Both noted that Chewie had more color in his fur for the Return of the Jedi. Both also commented how much happier they were with the costume over the Revenge of the Sith version, which was only meant to be used for a few shots. Admittedly, it sounds a bit dumb saying the official Star Wars Instagram page shared an official pic. But we weren’t sure if it was a promo costume for an event or something. Well, it was for The Force Awakens. So we saw Chewbacca from the film about seven months ago. Meaning we’ve only seen Artoo-Detoo and Chewbacca officially. Two of the Chewbacca concepts do not feature a robotic hand, as mentioned before. One has Chewbacca with his classic slouch, but I think its a little more exaggerated, but that may be because of the art style more than his age. He has his bowcaster and classic bandolier. The second one is a profile shot of Chewie. He looks a little healthier. I wouldn’t say he’s fat, but he’s put on a little bit of weight. This one has a little more grey shown in his fur, but nothing really major. It doesn’t seem like they played much with the classic design of the best damn Wookiee I’ve ever had the pleasure of meeting. The dude was already two hundred years old when we met him the first time. He’s probably only aged a decade in Wookiee time. Oh yeah, Legends fans, don’t point me towards some Wookiee life-span fact somewhere. That was just a joke.